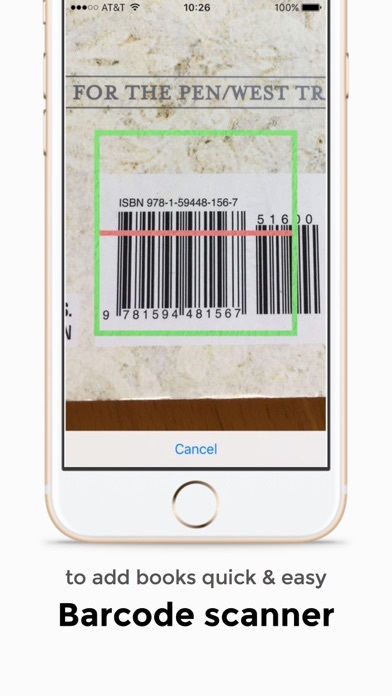 Includes Barcode scanner to make adding books super fast! 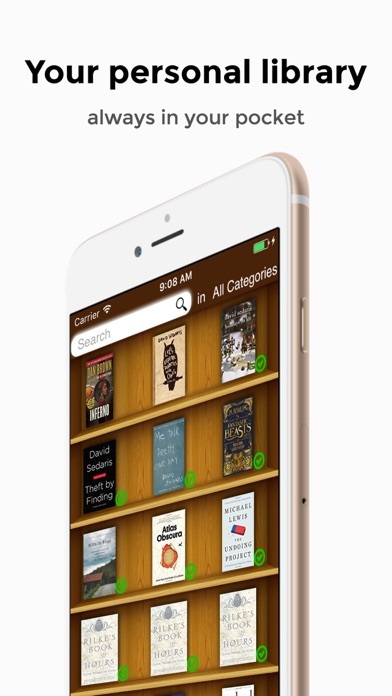 "The ideal repository for book recommendations gathered from friends, reviews, and other sources, the app will locate the actual book cover and store it on its iBook-like shelf or as an entry on a list. 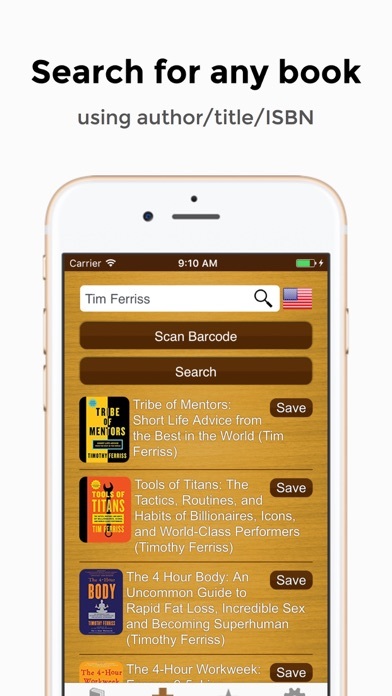 The app can also access all the book titles, charts, covers, descriptions, and acquisition options in any of the iBookstores worldwide, Amazon, and the free texts at Google Books." 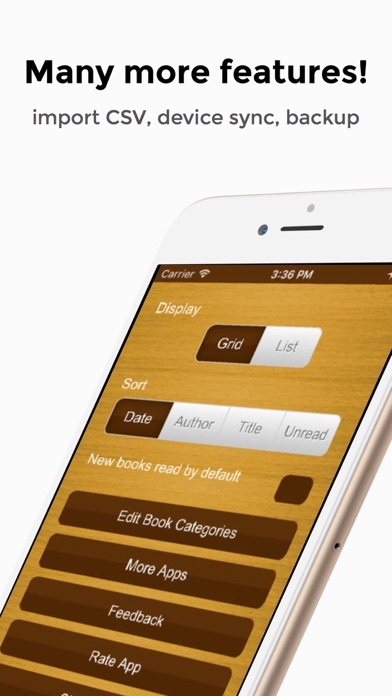 A simple and beautiful layout will help you keep track of the amazing books you come across. 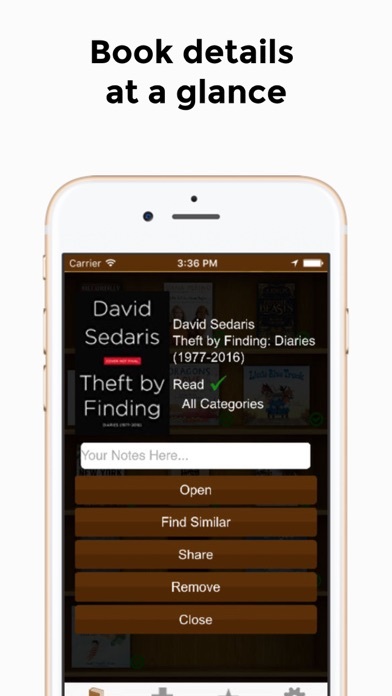 Feature Highlights: * Create a personal library of books * Information is retrieved directly from Amazon and iBooks Store * Add manually (not via search), or SCAN BARCODE * Snap picture of cover when manually adding book * Includes charts of top books for all genres * Book Genius feature (find similar titles) * Touch link to view details for each book (and easily purchase) * Entire library is locally saved/cached * 2 different library views (grid and list) * ability to sort the list * share features * export features It's also a great help when friends and family suggest books to you and you never know where to write them down and eventually forget. "Every day you hear or read about a book that sounds interesting - and now there's an app designed to help track all those books recommendations," commented developer Giacomo Balli. "My Book List is the personalized book list of all the books you've been meaning to read, and those you've read." If you choose to purchase Full unlock // Premium Upgrade Subscription, payment will be charged to your iTunes account, and your account will be charged for renewal within 24-hours prior to the end of the current period. Auto-renewal may be turned off at any time by going to your settings in the iTunes Store after purchase. Current subscription price is $9.99 USD/month. Prices are in U.S. dollars, may vary in countries other than the U.S. and are subject to change without notice. No cancellation of the current subscription is allowed during the active subscription period. If you don’t choose to purchase Full Unlock Subscription, you can simply continue using the app for free. Would be nice if the save button changed color to confirm the save. Would also be nice when you scanned in a bar code if it asked if you wanted to add additional books by that author, and when you said yes it would only show you the books not already entered. Would have been nice to know the various costs up front but not a deal breaker for me. Used to be great, but latest update refuses to restore purchases and just opens a bloody Facebook page. How do authors of a library app not know that Facebook is not an actual BOOK? Pathetic to rob people, period. I down loaded this App hoping it can keep track of my books and E-Books. After I pay all the add-ons, try to import all my e-Books from Amazon (I have over one 100 e-books). The App retrieved about half my e-books, then my IPAD FROZE up. Rebooted the App then I when try to manually add a book or E-book I get errors. When I add new books the response is: Found author: Authors name Title: Title of book Is this correct? : add or canceled Then I revived error message: Amazon error service unavailable (503) You are submitting requests to quickly Please retry your requests at a slower rate. This App has to May unresolved problems. So, waste of time and money. Needs work and I need a refund. I scanned some books and they got added to my list. Then I tried to add a book manually and I got stuck in a loop. Then I went back to scanning and it said, “error scan in progress” so I logged out of the app and logged back in, tried to scan a book and got the same error message. More information about each book would have been nice without having to be redirected to yet another website/amazon. It works well maybe 85% of the time. Every other update seems to be problematic and it takes a long time to be fixed. Right now my list shows 11 books and over a period of several years, I have added hundreds of titles. They are either frozen or lost. Maybe, in time, the list will be restored. Basically you have to pay to get this app, then you have to pay more to use it. Got this cos it looked useful. But every feature you use has at least a $.99 price tag on it. And it’s limited to scanning 13 books. And it’s a more than $.99 to unlock the bar code scanning feature.